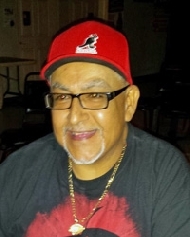 Roland Cardona Sr. obituary. Carnes Funeral Home. Roland went to rest on September 9, 2017. He was born on July 4, 1966 in Texas City, Texas. Roland was friendly, loving, humorous, proud and reliable. Roland never met a stranger—he had numerous friends that he always remained close to. He was an avid fisherman and spent many late nights and early mornings catching flounder at the Texas City Dike—of which he would certainly brag later. Roland loved being around his family and friends, laughing and making jokes, having BBQ cook-outs and hosting holiday parties at his home. He mostly enjoyed being in the company of those that he loved. And when someone was in need, he was there to lend a helping hand. He was preceded in death by his Mother, Frances Luna Cardona, Father, Alfonso Cardona Sr., Sister, Rachel Morales, and Brother, Xavier Cardona (Hobie). Roland is survived by son, Roland Cardona Jr.; daughter, Alicia Scott; brothers, Alfonso Cardona Jr. (Curly), Ralph Cardona and Mark Cardona; sister, Laura Cardona; grandchildren, Elijah Scott, Jeremiah Scott, Mariah Scott, and Dahlylah Scott, and son-in-law Shane Scott. Roland has an abundance of extended family including Aunts, Uncles, Nieces, Nephews, Cousins and many friends that were just like family to him. Roland will be greatly missed by many. Guests are invited to share in a Celebration of Life Visitation from 5-7:00 p.m., on Wednesday, September 20, 2017 with 7:00 p.m. Memorial Services to follow at Carnes Funeral Home, 3100 Gulf Freeway, TX 77591.